Mobile services market in India is forecast to grow at a CAGR of 5.2 per cent to reach USD 37 billion by 2017. New Delhi: Driven by strong adoption of data consumption on handheld devices, mobile services market in India is forecast to grow at a CAGR of 5.2 per cent to reach USD 37 billion by 2017, research firm IDC today said. According to IDC, the total mobile services market revenue in India will reach USD 29.8 billion (about Rs 17 lakh crore) by 2014 and is expected to touch USD 37 billion (around Rs 22 lakh crore) in 2017 with a CAGR of 5.2 per cent. "Among mobile services, only mobile broadband services show strong growth, meanwhile SMS and MMS are on a decline trend. Voice services tend to have a flat growth rate," IDC Asia Pacific Telecommunication Group Senior Research Manager Ashadi Cahyadi said. With recent operators' initiatives to introduce more content/applications and improve consumer awareness for data services, mobile data revenue is expected to grow in India, Cahyadi added. The strong growth in revenues from mobile broadband or data connectivity is also expected to be driven by increasing penetration of affordable smartphones and faster rollout of 3G and LTE services across the country. 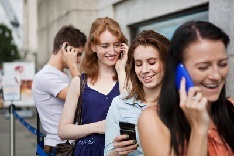 "For India, mobile broadband market in 2014 will continue to have strong growth compared to other mobile services market. This service is expected to reach US 7 billion by 2017 with a CAGR of 32 per cent," Cahyadi sad. 3G subscriber addition will hold the highest five-year CAGR of 68 per cent compared to other mobile technology, IDC said. "This is mainly due to more 3G services coverage across the country, especially in the big cities. With this trend, operators should focus more on their mobile broadband strategy," Cahyadi said. The Asia Pacific (excluding Japan) region, considered more dynamic market than other emerging and mature markets, is expected to see the growth rate for voice services revenue slow down and achieve a compound annual growth rate (CAGR) of 2.5 per cent. However, data connectivity or mobile broadband revenue will grow at a CAGR of 19.3 per cent from 2012 to 2017.